1. Go to the produce store/the farmers’ market/the shuk. Buy every single thing that looks the slightest bit interesting to you, and then some. If it grows from the ground, buy it. But if you live in a neighborhood like mine, where your produce store sells cactus leaves and the like (yes, people actually eat them), skip those items. Do buy the fresh herbs. And be sure to get the fresh lemons and limes. Next, mosey on over to the dried bean and grain aisle and pick out whatever looks interesting. If it’s a raw grain or bean it doesn’t need a hechsher. Pick up a big bottle of olive oil and grape seed oil in the oil aisle just because it’s cheap. 2. All those veggies won’t fit in your fridge so make soup. Soup is easy and cheap. You can make it and freeze it–double it if you like, and it fills people up. Every recipe is pretty similar: Saute an onion in oil over medium heat until lightly browned. Add chopped garlic and brown some more. Add whatever vegetables you think will go together–and if you think they will, they probably do. Trust your taste buds on this one. Potatoes go with leeks, tomatoes go with basil, sweet potatoes go with carrots, butternut squash makes a soup all on it’s own. (Find more ideas by searching my blog for “soup”). Then add water, stock, or coconut milk (if you’re making a squash or Thai soup). Add two teaspoons of salt and freshly ground pepper. Let it simmer until every veggie is nice and soft. Then blend it with an immersion blender if necessary. Taste it, and if it’s bland, add more salt. Add some of those herbs if you like. 3. Roast the rest of those veggies. Next week, turn your oven on 425 degrees and take out the rest of your veggies and the biggest trays you have. Chop them up however you like and shake some salt and freshly ground pepper. Don’t be afraid to add sprigs of the herbs too. You’ll look fancy if you do. Drizzle some olive oil over that and toss to coat. 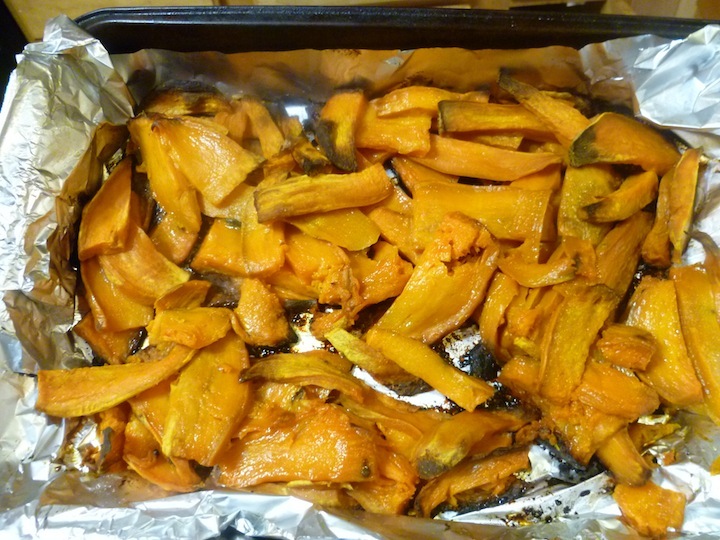 Put them all on the tray, together or in sections, and roast for 20 minutes. 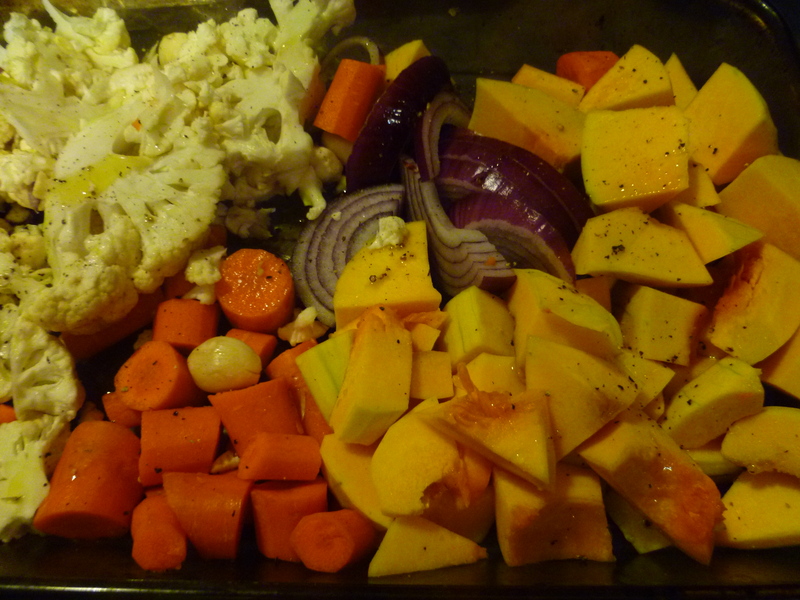 Turn the veggies and roast 20 minutes more. Remove them if they are browned to your liking or leave them if they aren’t. Remove only some if they cook faster than other. If you’re going to reheat them on Yom Tov, leave them slightly less done. 3. Saute what’s left. If you don’t like the idea of roasted greens (although kale chips rock), chop them up and saute them with an onion, garlic and olive oil. Add some salt, freshly ground pepper and the juice of half a lemon. 4. Saute some toppings. Don’t even bother cleaning out your saute pan. Simply remove the greens and toss in some bread crumbs with a dash of salt, paprika and any other spice you like. Saute them until they are lightly brown. Remove those and then dry roast some nuts, like cashews or pecans, while you’re at it. If you like coconut, brown some of that when you’re done with the nuts. Put all your toppings in separate baggies once they fully cool. 5. Cook those grains. Make a huge pot of rice, a pot of barley, a pot of wheatberries, some cous cous, some orzo, maybe some farro, whatever. Add some olive oil, salt, pepper and chopped herbs. Lemon tastes nice too. Store it in your fridge if you’re making it ahead of time. 6. Prepare some beans. Trust me on this one, beans go with vegetables. 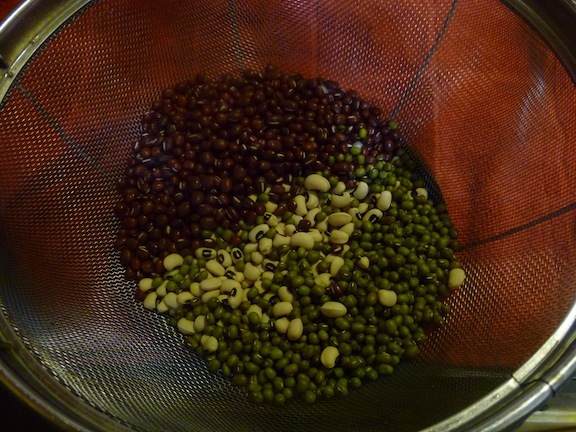 Black beans, mung beans, chick peas, lentils and white beans are particularly nice. Soak some in a bowl of water, rinse it and pot them in a pot to simmer. The beans are ready when they’re soft, but not too soft. Google it, if you’re not sure how long to simmer them. Add salt. 5. Serve. Start each meal with a soup. Then lay out your grains on a tray, use one each meal or combine a few, and spread out some of the roasted vegetables and a few beans on top. Add the greens if you like, or serve them separately. 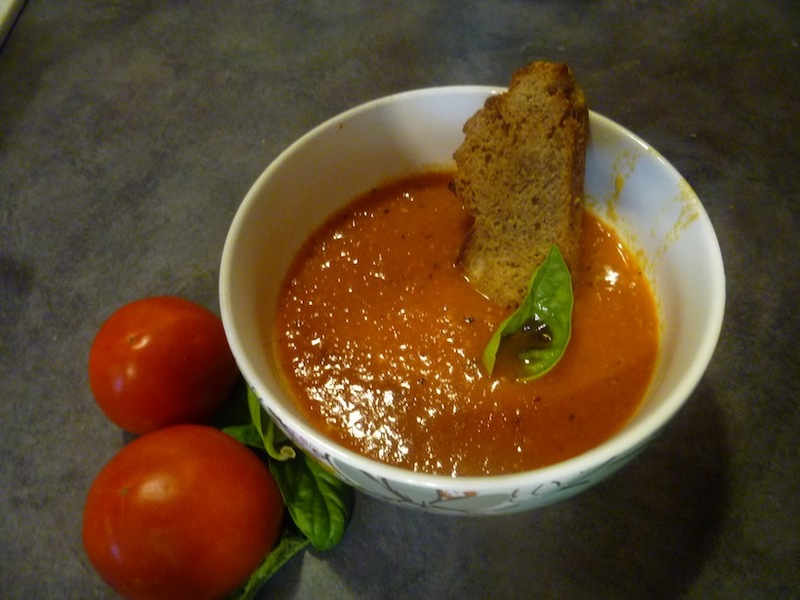 Use your pan-toasted toppings on top of that or even on top of your soup. Add some freshly chopped herbs. Your combinations are limitless, which is a good thing because the upcoming number meals are nearly that much as well. 6. Serve a meat dish and a salad too, and you’re done.